What should New Zealand do about Fiji? As the country slides further into dictatorship, under Bainimarama, how should we respond-if at all? In my opinion, New Zealand needs to be extremely tough-isolating Fiji in every possible way, while offering moral and practical support to genuine pro-freedom elements inside the country. I have long argued that China probably at least sanctioned the Bainimarama coup and that Beijing is trying to turn our neighbour into a client state. Now Prime Minister John Key has at least recognised that Chinese influence in Fiji may be a factor in pro-longing the dictatorship. China says it hopes Fiji will "take note" of the concerns of New Zealand, Australia and other countries about recent events in the Pacific nation, New Zealand Prime Minister John Key says. He met with Premier Wen Jiabao in Beijing on Wednesday and said Fiji was discussed. Premier Wen had noted the importance China placed on New Zealand and other members of the Pacific Forum in regional issues. "They hoped Fiji would take note of the interests of countries like New Zealand to resolve their issues and they would work hard to improve the relationship and there would be a constructive solution to the issues in Fiji," Key said. On Wednesday, Key expressed concern that aid from China to Fiji could undermine international efforts to restore democracy to the troubled Pacific nation. The issue may be addressed at a top level meeting in Beijing. Some fear that China will undermine sanctions against the military regime in Fiji by handing out aid directly to the self-appointed government. "Well-directed aid plays an important part in the Pacific and we are keen to work with the Chinese and others where it makes sense to co-ordinate that aid. Our concern is obvious really, which is that the risk, in the case of Fiji, is that they can circumvent the process if aid is not well directed." Unfortunately the China horse has long bolted. Key is well behind the times. China has Fiji in its pocket. Bainimarama knows he can thumb his nose at New Zealand because any sanctions we impose will be more than matched by China and India. Why then should we still take a hard line against the Bainimarama regime? The answer is to deter other South Pacific states from throwing their lot in with China. Also to encourage the decent elements left in Fiji that we stand with them against dictatorship. If we don't make a stand soon we will face a Chinese military base in Fiji, surrounded by a constellation of cooperating pro-Chinese micro states. Australia under a Beijing loving, socialist infiltrated Labor government, will be no help at all. Given a likely future US military retreat from the Asia/Pacific, that will leave New Zealand in a very insecure position. Given that that New Zealand has signed a Free Trade Agreement with the Beijing Butchers, we have little moral authority when it comes to warning our neighbours off Chinese influece. What we do about Fiji, comes down to what we are willing to do about China. If we don't make a stand against China's encroachment into this region, how can we expect more from our weaker and poorer neighbours? In reality there is not a Fijian problem-there is a Chinese problem. We need to stand firm against the Bainimarama dictatorship-and even more so against against the the "commodore's" Chinese puppet masters. Through failure to confront China we now have a dictatorship on our doorstep. 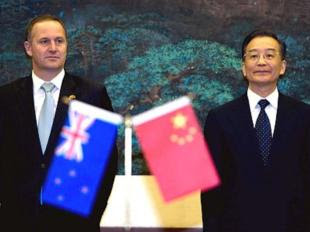 If New Zealand doesn't make a stand against China's malevolent ambitions, we deserve the same fate. Isn't discussing how to rectify Fiji's lack of democracy (and media freedoms etc.) with china like discussing with the KKK how to reduce racism?